Ira Fuchs’ powerful new play about a Jewish Ghetto in World War II, Vilna, starts off with a small crime, the bribing of a Nazi official with a bottle of liquor by a Jewish woman doctor, and ends in one of the greatest crimes in human history, the extermination of 60,000 Jews in the Polish city of Vilna, part of the mass murder of six million Jews throughout Europe. Fuchs’ stellar play opened last week at the Theatre at St. Clements on W. 46th Street, New York. It is a deep, rich and thoroughly frightening story of the Jews’ battle for survival in the city of Vilna, their faith in God, and each other, as truckload after truckload of them are taken onto the Ponary forest outside the city, where they are lined up and shot to death by firing squads. The story of the ghetto in this Polish city resembles many other stories in plays, films and novels. There is nothing terribly new about it. The heroes, resistance leaders, and the villains, the Nazis and collaborating local government officials, are the same. The difference, and what makes Vilna so outstanding, is the graphic violence, cruel and heart stopping, plus just tremendous acting by an all-star cast, whose work you will remember for quite a long time. The play tells an entirely true story, although some of the scenes have been invented but resemble similar scenes at other ghettos and execution sites. Vilna was a city of more than 80,000 Jews in a larger population. The Jews were the backbone for a large cultural community that included theaters, symphonies and operas. It was an Emerald City for Jews in Europe. Starting in 1941, the Nazis, who occupied the city, began forcing the Jews into a ghetto, much like they did in Warsaw and other cities, denying them health care, food and sanitation. The Nazis established a Judenrat, or central committee, of Jewish community leaders, to run the ghetto. Then, systematically, they began to remove hundreds of Jews each day and murder them at a forest concentration camp (a total of 100,000 people, Jews and others, were executed there). Vilna is the story of the Judenrat and its members, and the members of their families. It is also the story of Motko Zeidel and Yuri Farber from their high school days in 1926 to the end of the war. 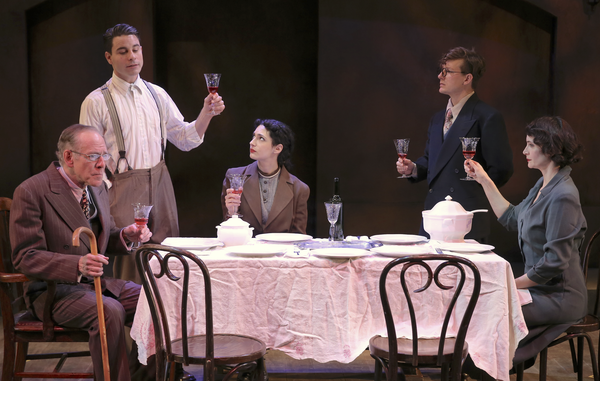 Through their story, playwright Fuchs tells the tale of all the Jews in Vilna and tells it well. Motko and Yuri wind up working for Jacob Gens, a Jewish hospital director and father of a teenage girl. They do fine work of running the Ghetto – curbing diseases and preventing starvation and crime, until the Nazis tell them that it is their job to decide who shall be murdered and who shall survive (in the end, nobody survived). They made heart breaking decisions and suffered for them. The play, deftly directed by Joseph Discher, is carried by its actors. Sean Hudock, who plays Motko, and Seamus Mulcahy, who plays Yuri, are marvelous in their roles, especially towards the end of the play. There is a scene in which Moto tells his father about his job of deciding who lives in which his dad, really shaken, rubs the side of his face with his hand and Motko starts crying and his body stiffens. It is a striking moment. There is another moment when the Nazis discover that Yuri changed architectural plans for the execution grounds to save Jews. He shakes with fear because he thinks they are going to hang him for his transgressions. It is one if the best moments in theater I have ever seen. Nathan Kaufman is impressive as Judenrat leader Jacob Gens. There is a scene where he is having dinner with the Nazi chief and time after time quivers, his eyes frozen wide and his jaw trembling, as the German tells him of the awful things he has to do to his own people. The violence is disturbing but helps make the play as powerful as it is. At one point, a man on a platform is shot and there is a huge BANG in the air. Everybody in the theater was shocked. That, though, is the least violent act in the play. You sit there and shudder when you watch the violence, and know that it happened in Vilna, and in other Jewish ghettos, again and again and again. One of the wonders of the play is the superlative acting by minor characters. Zeidel’s mom, the Jewish doctor, played wonderfully by Cary Van Driest, is brilliant as Jew, Mom and physician. His father, the elderly Josef Zeide, is play with both anger and tenderness by Mark Jacoby. The Nazi leader, Bruno Kittel, is one of the most vile, vicious stage characters I have ever seen. You can almost feel the floor of the theater wobble when he struts across the stage and you can feel the air in the theater move when he waves his arms hysterically. Their performances make the play. Others in this fine cast include James Michael Reilly as the director of an engineering firm, Brian Cade as Martin Weiss, the chief Nazi and Paul Cooper as Kittel. A few summers ago, I visited a concentration camp outside of Hamburg, Germany. It was set, like so many were in a beautiful forest with nearby lakes, streams, clusters of swaying green trees and sweet-smelling flowers. You stand there and visualize the horror of what happened and ask yourself how human beings could do such things to other human beings. You think the same thing as you watch Vilna. How could this possibly have taken place? Production: The play is produced by the Theatre at St. Clements. Scenic Design: Brittany Vasta, Lighting: Harry Feiner, Costumes: Devon Painter, Sound: Jane Shaw. The play is directed by Joseph Discher. It runs through April 11.